Where to stay in Seminyak? Lets get oriented. 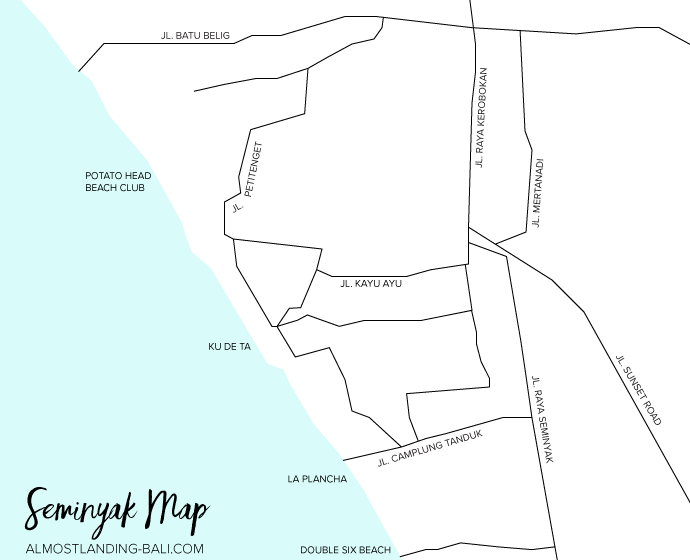 Here are a few things to help you get oriented to Seminyak, so when you look at a map of where your hotel is, you know whats directly around you. Seminyak sits in between Legian (south of Seminyak) and Canggu (north of Seminyak). Petitenget is an area of Seminyak that is more in the north and has some great restaurants and boutique shops. This is the area where Potato Head Beach Club and the W Hotel are. Jalan Kayu Ayu (otherwise known as Laksmana) is one of the main streets in Seminyak lined with restaurants and boutique shops. It’s more inland and not right near the beach. 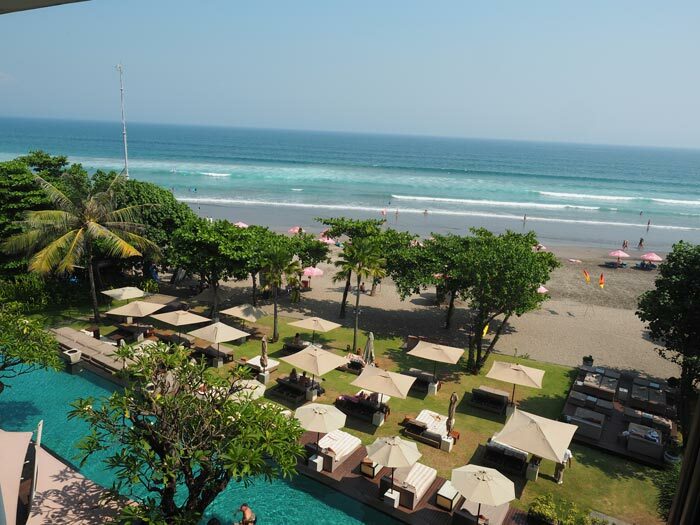 The southern area of Seminyak directly borders Legian, around the area of La Plancha beach bar and Double Six Beach. This area expectedly has more of a ‘Legian’ vibe than other parts of Seminyak, which isn’t a bad thing, just different. And the area lining the beach, depending where exactly, may not be as close to the main shops and restaurants, but is obviously the easiest place to stay to access the beach. We love using Booking.com, it’s one of our favourite ways to book Seminyak accommodation and has a great range of properties. 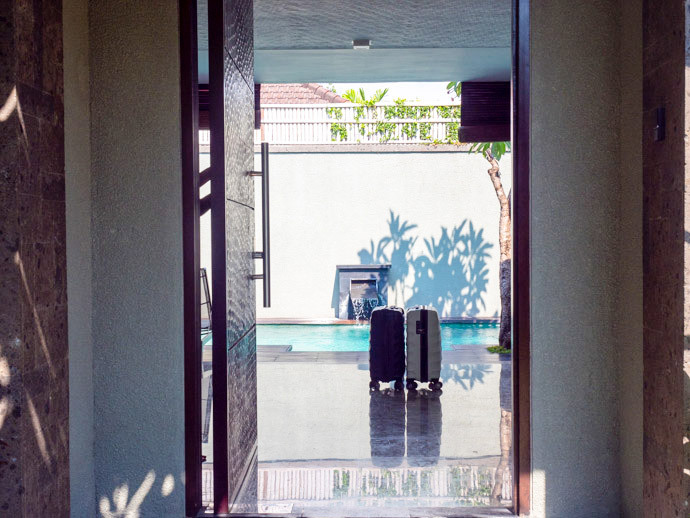 We have been lucky enough to stay in lots of amazing accommodation throughout Seminyak, but we haven’t stayed everywhere and want to make sure we are recommending the best. 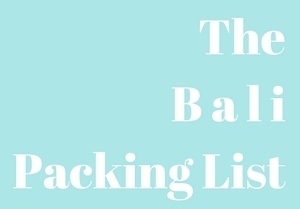 So the recommendations below are based on our favourites that we have stayed in, knowledge of Seminyak hotels and their specific locations throughout Seminyak, lots of research, reading reviews, hearing from you guys and just putting this all together with our own experience of Seminyak. Please note: Prices were accurate at the time of this post, based on peak season, and are per night. 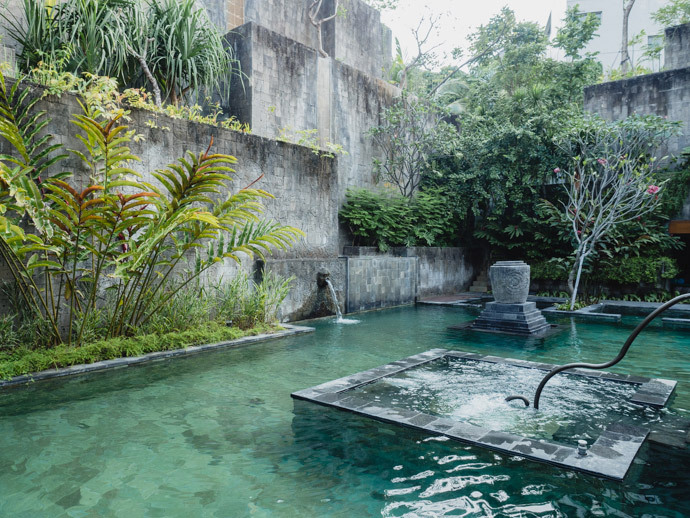 There are so many amazing places to stay in Bali, and Seminyak is no exception. We look for hotels in a great location, with great design and service. 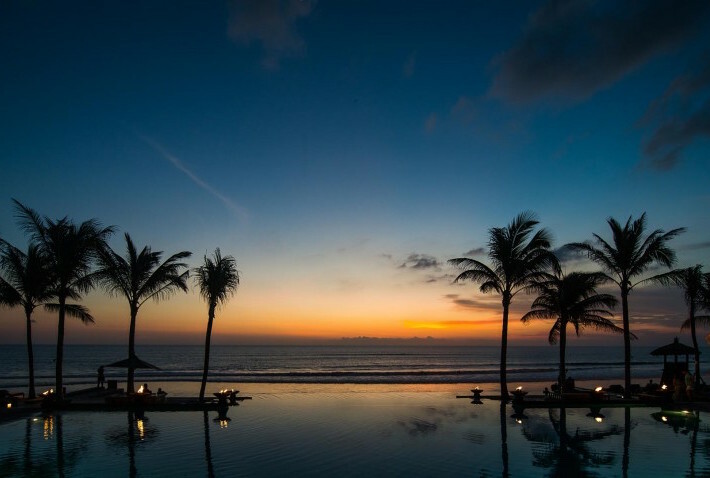 Here our our favourite picks for luxury Seminyak accommodation. Anantara Seminyak is a boutique hotel with only 60 rooms, perfect for couples. The rooms are absolutely massive (from 80 m2) and feel so luxurious with their marble and wood finishes. Oh, not to mention it’s right on Seminyak beach, the views over the beach are amazing and don’t even get me started about sunset. Anantara Seminyak also have a great spa and rooftop restaurant/bar, MoonLite Kitchen and Bar. If you don’t stay here, definitely come here for sunset :) Read more about our stay here. 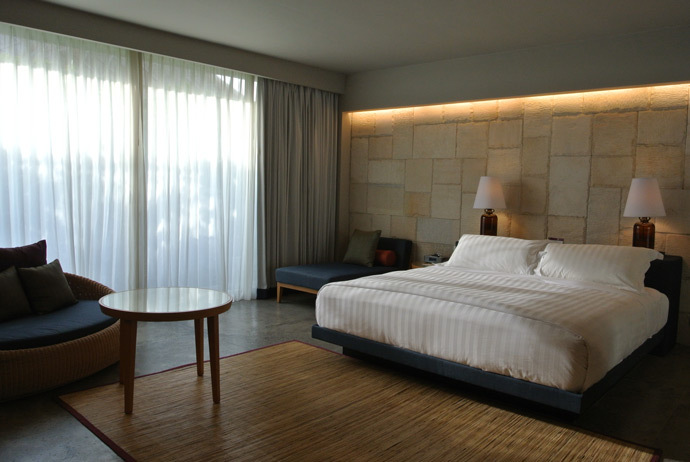 We loved our stay at Hotel Indigo Bali. This beautiful hotel manages to feel both grand and like your own secret little escape all at the same time. The design is stunning, the staff so friendly, the rooms start at 50 SQM, and the secret garden pool is a favourite. Read more about our stay here. 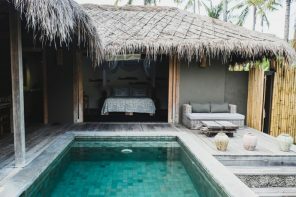 Although we haven’t yet stayed at Alila’s Seminyak hotel, we have absolutely loved staying with Alila in Ubud and Manggis. 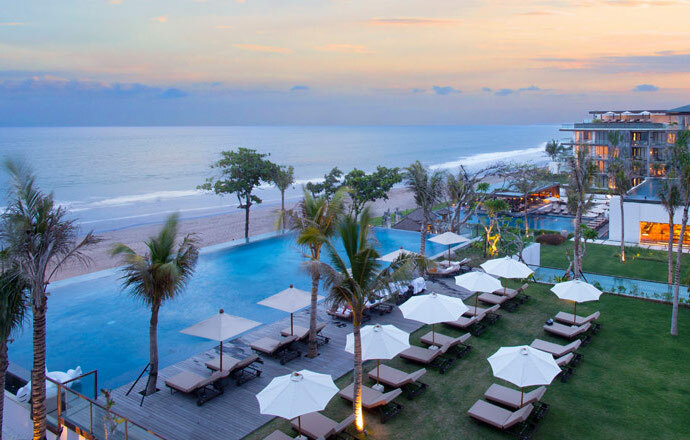 Alila is a brand we love and Alila Seminyak is their newest Bali hotel. It looks amazing and I’m in love with the minimal design. One thing I admire is that the hotel was designed and built to minimise the environmental impact. 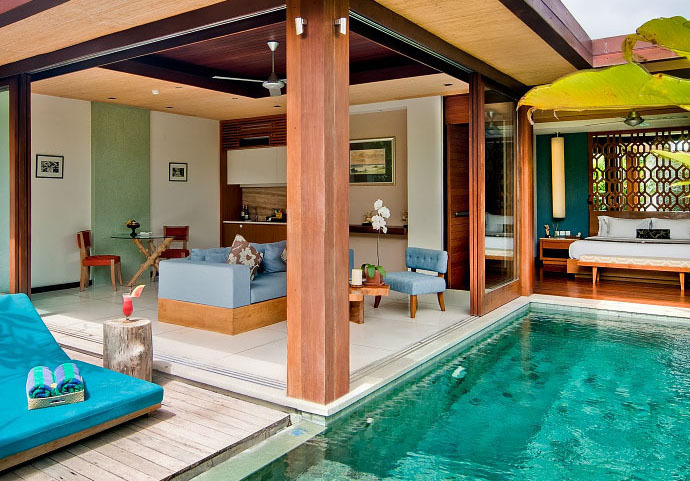 Peppers Seminyak is a villa/hotel hybrid, combining the best of both worlds in Seminyak. With 48 villas ranging from 1 through to 5 bedrooms, and combining this with resort facilities such as a restaurant, gym, spa and pool (all villas have their own pool too! ), leads to an unforgettable stay. We were blown away when we arrived and walked into our villa… even the door’s beautiful ;) Read more about our stay here. A hotel we are yet to stay in, but an obvious pick to recommend. The hotel is beautiful with a huge pool area, bars, restaurants, uniquely designed rooms and great dining. 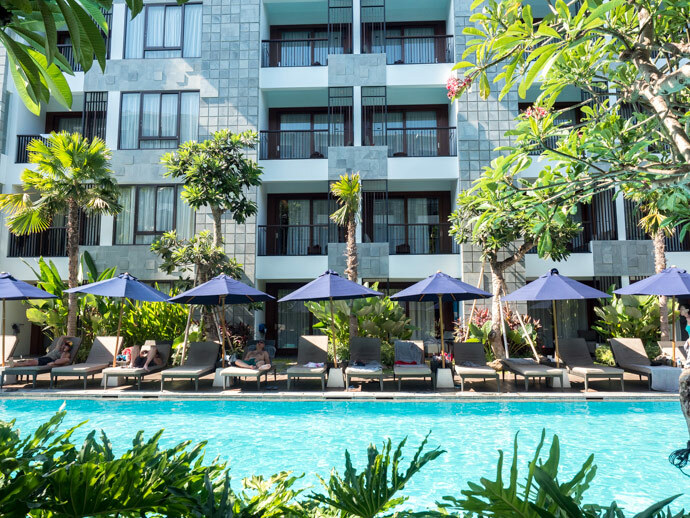 The Legian is an iconic hotel, but don’t be fooled by the name, it’s actually in Seminyak. And it’s in a great location in Seminyak, right on the beach and also near shops, restaurants and beach clubs. A beautiful 5 star hotel that comes well reviewed. The Samaya is another 5 star hotel right on the beach and with shops, restaurants and beach clubs within walking distance. 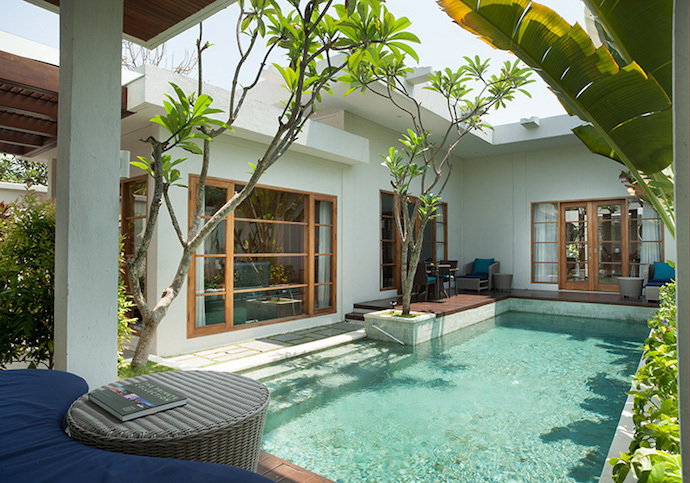 The Samaya is unique in that they only have pool villas. They also have a great restaurant where you can sit almost on the beach. Courtyard By Marriott Seminyak is a great hotel for groups of friends, young couples and families. It’s a really inviting and fun hotel, with a great pool area, and in between the beach and the main road for shops. Read more about our stay here. We loved our stay at U Paasha, with a great location, open spacious room and great rooftop pool. We also thought their idea of 24 hour check-in/check-out times were great and flexible. Basically if you check in at 6pm you can check out at 6pm. 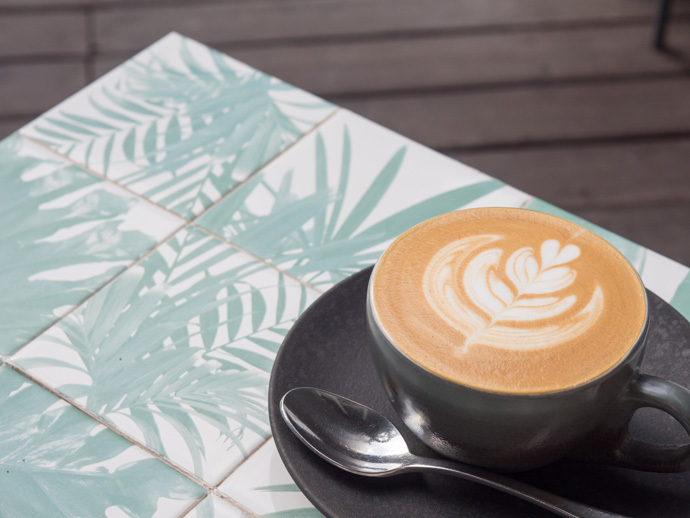 We first discovered Maca Villas & Spa by visiting Ippolito Speciality Coffee which is located within the Mase Kitchen Restaurant, the restaurant linked to the Maca Villas & Spa. We loved our breakfast and coffee here, so that would be a nice addition to the beautiful villas. Although a little isolated, they offer a free shuttle service. IZE Seminyak looks like a hotel providing great value for money. In a great location, particularly for restaurants and shops, and with a simple modern design. Located in a quieter part of Seminyak, stay here if you want to be in Seminyak but further away from the main area. A nicely designed hotel and rooms. The L Hotel Seminyak is in a quieter area of Seminyak, although still on a busy road. The design is aimed at luxury, albeit a little over the top at times. Still, it seems to provide good value for money. Although the rooms are quite simple, the location is great, particularly for access to food and shopping. It also comes quite well reviewed. We will continue to update this post with any new places we stay and love, to make sure we are recommending the best Seminyak Accommodation. 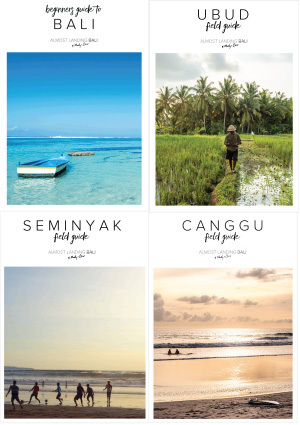 Once you’ve found the perfect place to stay in Seminyak, take a look at our Seminyak Field Guide for some more inspiration. 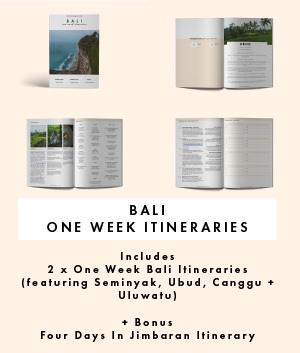 Our Seminyak Field Guide has everything you need to hit the ground running, including our favourite food, culture, shops, things to see + do and day trips. We’ve also put all of our favourites onto our own Seminyak Map so you can literally just take it out with you and no research or planning is required. 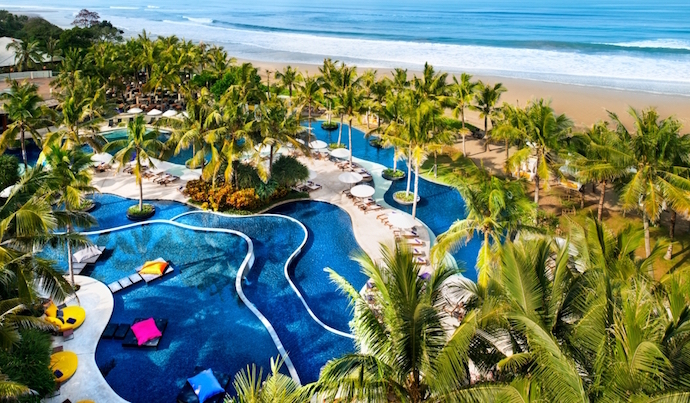 Hi Zubair, so happy it’s helpful, I’m sure the weather will be great for you in August :) We have not stayed at The Royal Beach Seminyak, but we have stayed literally next to it and it is in a great area. The beach is right their as well as La Plancha and you can walk along the beach to Ku De Ta and even up to Potato Head if you want to. There are places to eat right nearby, but many are a little further away (including ‘eat street’ aka Jl. Laksmana/Jl. Kayu Aya). Easy to get to in a quick 5minute taxi, or you could still walk to some if you wished. If you walk along the beach you can get in quicker. Overall it’s a great location and hope you have a great time in Seminyak! 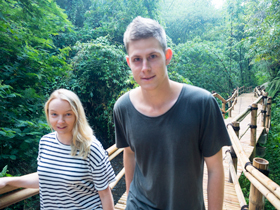 Thanks for sharing your Bali travel tips! My husband & I are traveling from the US in May for 12 days. 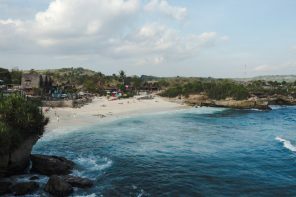 The first 3 nights we are staying at the Royal beach in seminyak, the second 3 nights at the Sri ratih cottages in Ubud & then 5 nights on Gili T at the Le Pirate Beach club. Have you stayed at or heard of any of these accomadations? We booked based on visitor ratings & deals on trip advisor. My other question is do we need to have IDR before we leave or can we convert US dollars when we arrive in Bali, and about how much would you budget per day if we wanted to spend freely (not have a strict budget). Thank you! I like the itinerary and whilst we have not stayed at the hotels you have booked, all your hotels look great :) You can change US dollars but I would say it would be better to use the ATMs when you are there. They are easily found and we have never had any issues accessing money in Seminyak and Ubud. There are ATMs on Gili too but maybe just bring it with you to the island. Most hotels and many restaurants and cafes will accept credit/debit cards too if you want to minimise cash out too. Whenever we arrive we normally always use an ATM at the airport before ordering a taxi or making our way to where we are staying. In Bali, you can certainly have cheap days but you can still spend big on days too. It is completely dependent on your holiday and travel style and what you get up too. For example, a meal could cost between $2 at a local warung through to $100 dinner and drinks at a fancy restaurant (and everything in-between) and same with everything you can eat/drink/and do in Bali. Hope this helps! Wishing you and your husband an incredible trip!